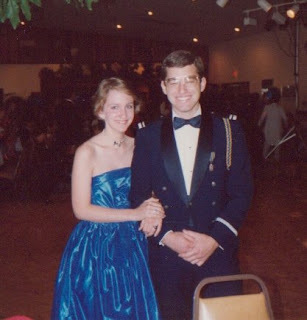 Senior Prom 1987. That's all I need to say, right? I loved the dress when I bought it but was so ratcheted up in the week between buying it and the event that I had lost a lot of weight. So much weight that when I put it on it stood up by itself, about 3 inches shorter than it needed to be to avoid epic "wardrobe malfunction." As that guy rang the doorbell my mother had her arm down the back of my dress and was sewing me into it. Thank goodness my mother had a solution. The guy*, you ask? Oh he was just the big brother of the guy I was totally in love with. He'd graduated from my school 3 years before, was in a ROTC program so his outfit was free and actually asked me to my own prom. Was he thoroughly in love with me? Oh heavens no. By being my date he could come to the all night after party on the boat. The girl he was in love with was also wrangling an invitation to that party so they could spend the night together. Which I agreed to why exactly? I do not know. I don't remember having this picture taken. It turned up in an album on Facebook today and I thought you guys would get a charge out of it. When I showed it to Audio Girl she said, "Aw, you look pretty. It's not like you have (makes claw hand gesture on forehead), you know, hair, right?" *Some of you may know his real name. Let's keep that out of the comments, please, don't want to be googleable.